Summer is here and this gives photographers the chance to capture some stunning shots of butterflies. Heading out to capture images of some of the 56 species of butterfly in the UK won’t just give you the chance to net some impressive prints, however. It also allows you to help with conservation. Did you know that because of our impact on their habitats, three-quarters of British butterflies are in decline? To keep track of numbers every year, photographers and the general public are asked to join in with the Big Butterfly Count, which runs from 14th July to 6th August. Want to join in? Just visit the website and you can download an app where you record sightings. Now it’s time to fine-tune your skills with our best tips. If you have a large garden, you may be lucky enough to have butterflies flock to you. If you live in a more urban area, however, it can pay to head out of town to a local meadow or nature reserve. This will stack the odds of finding some good subjects in your favour. What’s more, the Butterfly Conservation websiteeven has a map of recommended sites, so you can find one that’s close to where you live. Visiting at different times of the day will have an impact on the sort of images you will capture. If you visit first thing in the morning or just before dusk, you’ll benefit from golden-hour light. The compromise here, however, is that butterflies are far less active at this time, so you’ll have to do more hunting around to spot your subjects. Shooting during the day means controlling harsh light, but butterflies will be fluttering around you, making them easier to find. If you’re just starting out in photography, don’t worry – it is possible to capture decent images with just a kit lens. In fact, most kit lenses actually boast a close-focusing distance of around 30cm. For the best possible images, however, a macro lens is ideal as it will help you to fill the frame. What’s more, it will allow you to capture close-up shots without needing to get too near to your subject, so you won’t spook the butterfly and cause it to fly off. Don't worry too much about the specific camera you're using as there are benefits to using different systems. Cameras with APS-C sensors, for example, will increase your effective focal length, but a full-frame camera will let you blur the background more easily. A tripod will help you to keep your camera steady and reduce the risk of blurred images, but you often have to keep moving position when shooting butterflies. In these cases a tripod can actually slow you down, so a good solution is to use a monopod instead. This gives you the best of both worlds, helping you to capture steady shots while still allowing you to move freely between positions. If you’re shooting during the day, the sun can create harsh lighting. The solution is to use a simple 5-in-1 reflector, which can be picked up very cheaply. Use the diffuser element from the middle – ie the main body – of the reflector, and place it between the sun and subject. This will soften the harsh light and improve the tones in the image, and will mean you’ll have to do in post-processing. When shooting any sort of macro photography, depth of field is always an issue. Here, your general aim should be to keep as much of the butterfly in sharp focus. With this in mind, an aperture of f/11 is a good starting point, but you can always adjust the aperture if you need a deeper zone of focus. Shooting in the Aperture Priority mode will allow you to control depth of field while the camera selects the shutter speed. When it comes to focusing on your subject, the best approach is to set up your camera with a single focusing point in the middle of the frame. If your subject is static, use the default single shot focusing mode. On Canon cameras this is called One Shot, whereas Nikon calls this AF-S. You may also want to activate the Live View function to get a larger view of the scene. If, however, you’re trying to capture a butterfly in flight, switch to Continuous focusing mode (also called AI Servo, or AF-C). The camera will continually try to keep the subject in focus for as long as the shutter-release button is pressed. Simply standing up and shooting from head height will often produce lacklustre results. The best compositions come from getting low down, level with the butterfly. This also gives you the opportunity to include some sky in the frame, which can add further colour to the scene. If framing your scene is tricky from these angles, you can use Live View. Many cameras now offer tilting LCD screens, which can also be very beneficial here. To create a shot with a difference, try to capture some of the butterfly’s natural behaviour. 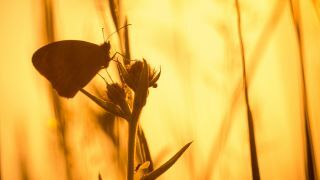 Images of butterflies jostling for position on a flower head, for example, or two butterflies mating, adds more interest and context to a photo, and will help it stand out from other images. These kinds of shots always do well in stock libraries too. Butterflies boasts amazing colours on the wings, especially species such as the Peacock (my personal favourite), Red Admiral and the Common Blue. To introduce even more colour to the scene, try and capture the butterfly as it lands on a colourful flower. One approach is to set up with your camera trained on a flower, and wait for a subject to land. This requires patience but can help you net some brilliant results.